When a woman cannot bear children, it tremendously affects her identity, but the pain can extend far beyond her to impact personal relationships. Although there is a large body of research addressing the emotional impact of infertility while a woman is actively undergoing treatment, the aftermath of infertility is almost never addressed. In fact, Marni Rosner, DSW, LCSW, a New York City-based psychotherapist, found that as of 2007, only 2% of research examined the postinfertile period. In her study, “Recovery From Traumatic Loss: A Study of Women Living Without Children After Infertility,” conducted at the University of Pennsylvania’s School of Social Policy and Practice, Rosner explored how women living without children after infertility rebuilt their identity and their life. Of the sparse research that addressed the aftermath of infertility, she found that most focused on women who had eventually become parents. But it’s the women who don’t have children who need special attention, as the impact of infertility for this population is often ongoing and crippling to their identity. When couples cannot agree on these important decisions, it is often due to an issue that existed prior to the infertility. 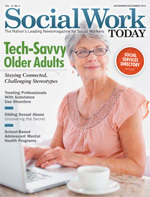 “A social worker can explore with the couple whether there are underlying issues that prevent them from reaching a decision that is best for the relationship,” Rosner says. Infertility also can impact a woman’s relationship with other family members, though overall, Rosner did not see tremendous shifts in long-existing family patterns. Still, even in a strong family dynamic, the infertile woman may experience painful changes. For instance, the woman’s parents may give more attention to her siblings with children or the infertile woman may now be out of sync with siblings as developmental stages are no longer shared. Social workers also need to recognize that infertile women who make the decision to stop treatment or not to adopt often continue to identify their infertility as the primary component of their “self” for quite some time. In Rosner’s study, she found that it took, on average, three to four years after ending treatment until the “feeling of being infertile” was no longer front and center.